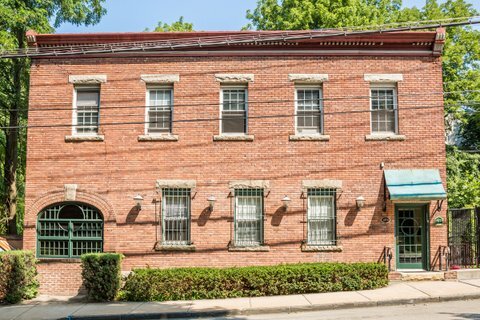 Of all the wonderful and diverse communities we have among us in the Hudson Valley, one of the most intriguing for both its promise of the future and grittiness of the past is Peekskill in the northwestern corner of Westchester. Historically, Peekskill is known as an American industrial center for its iron plow and stove products and for Binney & Smith Company, now makers of Crayola crayons, as well as Fleischmann’s Yeast, not to mention the notorious Peekskill Riots of 1949. Today, Peekskill is poised for a long awaited re-gentrification, promise after promise that it would come, with a spate of artists’ lofts and galleries, a colony of musicians, some really good restaurants, a beautiful park by the Hudson River and a number of housing opportunities that are moderately priced, including modest single family homes, but some that are surprisingly upscale, several condo developments, co-ops and rental complexes. And there are some grand secrets tucked in among commercial and multi-use buildings along its byways and alleys, the provenance of one which is occasionally debated with my friend County Legislator John Testa: the “Yellow Brick Road,” just over the railroad tracks near the river, behind the historic Standard House that now houses Dylan’s Wine Shop. Is this the yellow brick road that inspired L. Frank Baum’s famous road in “The Wizard of Oz?” John says, doubtful. I say, let us have our fun with it. In our last debate, I think John won. Peekskill claims its oldest business as Dain’s Lumber, founded in 1848 on the waterfront and today run by Jeff Dain, great, great grandson of founder Nathaniel. And, a fascinating building directly across from City Hall on Main Street, now being magnificently restored, housed a theatre in the 19th century where both great American actors Edwin and John Wilkes Booth, the assassin of Abraham Lincoln, performed. But an interesting secret that I never knew was revealed to me just recently when I listed a mixed use building at 650 Central Avenue owned by Bob Frissora where he and his son Steven run Arcanna Marketing Group, famous for the development of the NASCAR logo and several prominent PepsiCo brands. Aesthetically, the Frissoras’ offices create a perfect commercial space on the first and lower floors, stripped to the brick walls and huge hand-hewn beams. On the second floor is a large, loft-like one bedroom apartment which provides rental income. Behind the building is the very active McGregor Brook running gingerly down to the river, giving the back area a feeling of the country even though the front is very much a city scene. What I didn’t know is that this building was part of a thriving industrial complex in late 1800s that covered the now visible brook that wends its way through the urban sprawl of the city. At that time, Binney & Smith Company used this area as its main distribution and warehousing facility. In 1864, John Binney started the Peekskill Chemical Company to manufacture products containing red iron oxide particles that acted as a preservative. This was the product used for painting out buildings and also become a part of American history as the standard color for barns that dotted farmland across the American landscape. Built in 1870, this particular building could also have been the plant for the production of carbon black used on tire thread on early cars, increasing its life by four to five times. The company that owned the building was a leader in developing pigments used to protect wood from decay and strengthen the composition of vulcanized tires while adding the consistent black color and white wall tires of the day. In time, the Binney family expanded their product line by including shoe polish as well as printing ink and the now famous Crayola Crayon brand. So the next time you open a box of Crayons, know that its origins are very close to home. And when you drive across America and see all those red barns dotting the farmland that graces our land, know that their siding might likely have been protected originally from iron oxide dye mixed in this building. And, if you have a fancy to own a piece of history as an investment property, one with a bit of “color” to it, give me a call.